Dan laments Debbie's departure while praising the Pagonging reprieve, and ponders where this leaves Troyzan, Sarah, Sierra, Cirie, Michaela, and the Game Changers season as a whole. Episodes 8-9: So who's in charge in here? 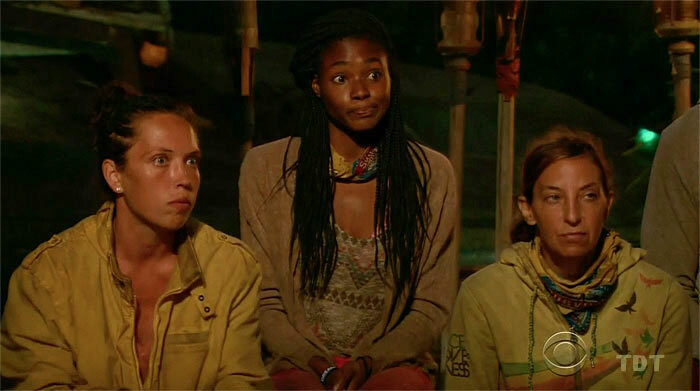 Jeff looks at the panoply of emergent chiefs in the new Maku Maku tribe, that great Cirie-Michaela moment, Ozzy's record-setting exit, other sundry game changing, and more. With two episodes and the merge reducing the cast down to a single tribe, Dan takes stock of where the remaining 11 contestants' stories could be headed in the remainder of the season. Dan takes a break from the story analysis to briefly touch on the events at Tribal Council, praise Zeke, and take a glimpse at the likely story after the upcoming merge. Jeff Pitman looks at the damage done in the awful Tribal Council from Episode 7 of Game Changers, but also at the potential good that did and can come from it. Plus a look ahead at the merge. Jeff Pitman examines the career of Queen Sandra, the new Exile Yacht, Cochran, Debbie, Tai, and the rapidly metastasizing idols/advantages in Episode 6, "Vote Early, Vote Often," of Game Changers. Plus a vidcap gallery! Dan laments the end of the Queen's reign, looks at how lingering Survivor mythology has affected her and other people's games, and digs deep into the Exile winner visit. Episode 5: Is she acting? As Survivor the game has changed, so has Survivor the TV show. Except in this episode, which seems to have borrowed some of the worst (read: thespian) impulses of the All-Stars season.